Perfectly Pink PlanetBox BottleRocket fits neatly inside the PlanetBox carry bag bottle pocket to provide a complete interstellar lunch kit. Easy to drink spout, 18/8 food grade stainless steel and vacuum insulated for up to 12 hours. Lead free solder used on the base of this bottle, which is also covered by a plastic base. 330ml. PlanetBox BottleRocket fits neatly inside the PlanetBox carry bag bottle pocket to provide a complete interstellar lunch kit. Perfectly pink base and cap colour. BottleRocket is brilliantly designed to be safe and easy for young children to enjoy and stay hydrated throughout the day. The straw-free silicone spout allows a natural sipping motion when drinking and the leak-proof cap is simple to open & latch tight. 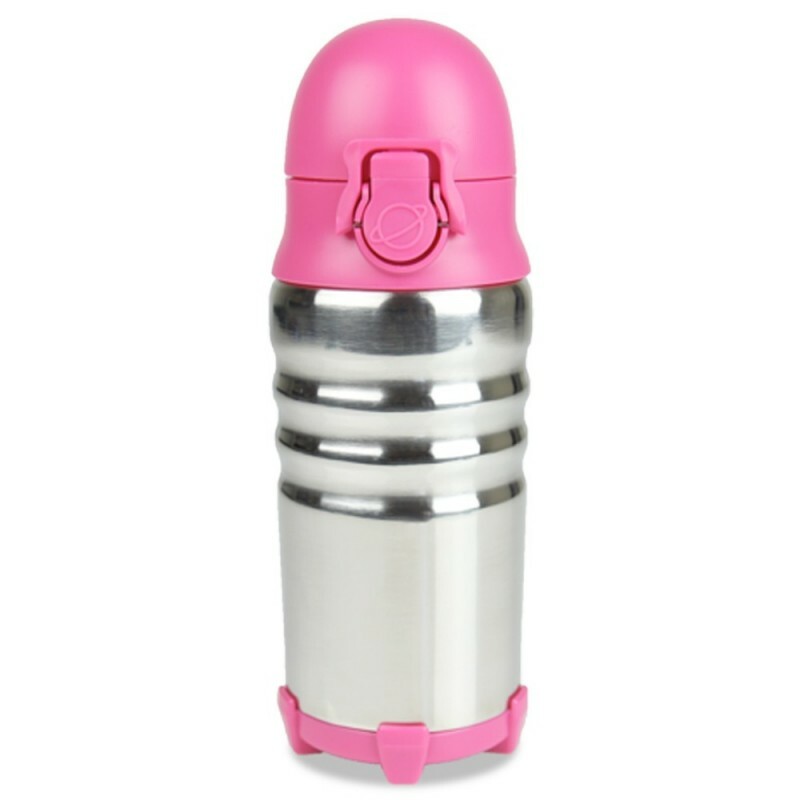 Made from 18/8 high quality stainless steel with vacuum insulation to keep liquid cold for up to 12 hours and the fun 'rocket' shape offers an excellent grip for little hands with no condensation. Choosing a quality reusable item designed to last saves you money and packaging waste going to landfill. Polypropylene and stainless steel parts are 100% recyclable, creating less waste at the end of its useful life. PlanetBox supports DrinkUp, an organisation whose efforts encourage people to drink more water more often. Food-grade silicone spout provides an easy natural sipping motion. Leak-proof polypropylene cap with simple latch closure stays open when drinking and keeps spout protected when closed. Designed so that no plastic comes into contact with your drink. High quality food-grade 18/8 stainless steel body in fun 'rocket' shape. Ergonomic grip great for small hands to hold. Double wall vacuum insulation keeps liquids cold or warm for up to 12 hours, with no outside condensation. Parts disassemble for easy & thorough cleaning - no straws to keep clean or replace. Fits most standard cup holders. Not suitable for children under 3 years - small parts hazard. Washing with soap & water is recommended, allowing it to air dry completely. Parts are dishwasher safe when lid is removed from stainless steel bottle. Do not use chlorine based dishwasher soaps or bleach in cleaning. 19.5cm tall x 7cm wide (widest point). 330ml capacity. Very happy with this water bottle, definitely will buy it again! This bottle is totally worth the price! Super high quality and love the look and feel. Perfect size too!